The Soumac technique is a form of warp wrapping by pattern wefts which proceed forward over two or more warps and back under fewer warps, giving a flat front surface. Most antique Soumac rugs come from the Caucasus where the technique is employed in carpet sized pieces with classic Caucasian geometric designs. Soumac technique may also be used on bags or as an extra decoration on pile rugs. Soumac carpets are lighter in weight than their pile analogues, but wear surprisingly well and can always be turned over for further use. 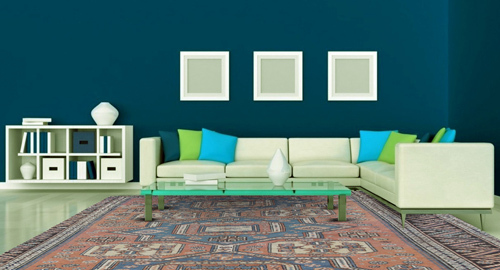 Small Soumac rugs and bags are among the most colorful and collectible of all antique Caucasian rugs.